Robert Pattinson makes People magazine's list of hottest bachelors along Twilight Saga's New Moon Co-Star New Moon actor Kellan Lutz. And how can he NOT??? With a face and a stare like that, I don't know what those eyes are telling you but I know EXACTLY what they are telling me! 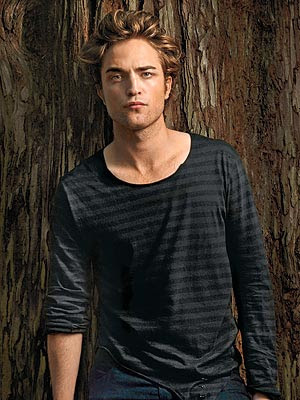 And the tree he's leaning on...Get me a water hose...I need cooling down!! He is one hot mutha******!!!!!!!! *sigh* he is too much for me. He's gets HOTTER and HOTTER!!! Dayum that man!! The tree he is in front of reminds me of The List...Can I have him??? *OME* I am totally shocked! ......Of course, the boy is on FIRE!!! Damn Ruub, you are too much!